The Health Story Project aims to integrate missing clinician narrative into information-starved EMRs to present the entire patient story across all healthcare channels. Consider that 600 million clinical documents are produced in the United States each year, and 60% of that clinical data is comprised of dictated and transcribed documents—essentially, the narrative that tells the patient’s story. Typically, the transcribed narrative is the information that forms the basis for reimbursement, proof of service, and quality of care between healthcare providers, not to mention that it serves as the foundation for why physicians initiate orders and make decisions about patient care. Despite these attributes, many industry professionals say it’s “grossly” underutilized in electronic medical records (EMRs) and other computer-based record systems. The reason? Lack of interoperability, or the inability to share documents across networks, says Nick van Terheyden, MD, chief medical officer with Pennsylvania-based speech recognition solution vendor M*Modal. “Overall, the EMR is the key to our future in fixing a broken healthcare system, but currently, it’s absolutely a data-hungry application,” he says, pointing to the fact that the typical electronic patient record is currently composed of less than 3% of direct clinician input. Fully initiated last year as a cooperative effort between Alschuler Associates, LLC; the Association for Healthcare Documentation Integrity in association with the Medical Transcription Industry Association; the AHIMA; and M*Modal Technologies, the Health Story Project is what many industry professionals hope will be a strategic step toward tackling the challenge of facilitating a gradual transition from unstructured narrative documentation to a structured, discrete, and computer-interpretable electronic documentation that will support standardized electronic health records (EHRs). Originally named the Clinical Documentation Architecture for Common Document Types (CDA4CDT) project, the initiative went through a rebranding this past December. van Terheyden concurs, noting that CDA4CDT “never rolled off the tongue very easily” and was later seen as a roadblock to marketing and educational efforts. Alschuler points out that for a number of years, the “narrative” has been the EMR’s enemy, a relationship that the Health Story Project aims to reverse. “If you look at even the most sophisticated IT environments in healthcare, they still need this because their EMR does not eliminate the narrative form,” she says. 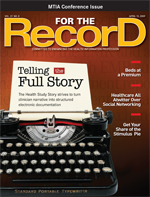 To date, Health Story has supported the development of four implementation guides using Health Level Seven’s (HL7) Clinical Document Architecture—the history and physical, the consultation note, the operative note, and the diagnostic imaging report—forming the basis that will allow the information in these clinical areas to be shared in an accurate and efficient manner. All of these guides have been approved as HL7 Draft Standards for Trial Use. By using these implementation guides, transcription documents can be imported directly into the EMR and aggregated along with EMR summaries in document repositories and document management systems for exchange, reporting, and analysis. In conjunction with its rebranding as the Health Story Project, the group has initiated a five-year plan to develop additional standards for discharge summaries and ambulatory and outpatient clinical notes. It will also address the standardization of reimbursement requirements within notes, says van Terheyden. The goal is to get these new standards on the HL7 ballot. “Now, it’s become a much more formalized project,” van Terheyden says, noting that a membership drive has been launched to create a broad and diverse consortium that will include EHR vendors, associations, and providers who share a common interest in making critical clinical information available to all participants in the healthcare process. “We’re building a much broader coalition,” he says. • the disassociation of formatting from clinical content review to streamline the process of producing clinical documents and create efficiencies. • the availability of predefined document models that eliminate the need to review format, headers, section headings, and other formatted areas. Because models are defined once and used, there is no need to review these areas. Instead, van Terheyden says the focus becomes the clinical content, which is more relevant and important. • the linkage of all the information at the time of production, making it unnecessary to rework the material, extract information postproduction, or review documents postproduction to extract data. Producing a Health Story file means that not only is the free-form narrative captured and validated as part of the production process, but the clinical data and structured clinically actionable data are also validated in a single step on a single file, says van Terheyden. “This produces much more useful clinical information, since it has been validated for both the narrative as well as the structured tagged data,” he explains. The most recent standard to be published, the diagnostic imaging report standardizes information flow between radiologists and EHR systems. van Terheyden notes that the new implementation guide was developed in conjunction with the DICOM Work Group 20/HL7 Imaging Integration Work Group and is consistent with the Transformation Guide from DICOM Structured Reports to CDA that is now in ballot within DICOM. Notable to the published guide is its recent incorporation into GE’s Centricity Precision Reporting product, creating a standard channel for sharing the clinical detail in narrative radiology reports and allowing radiologists to make the information readily accessible to computerized clinical information systems. As an early adopter of this standard, Stavrinakis explains that the most immediate benefits can be found in error reduction and efficiencies created by consistent reports. In the future, she believes that it will provide a consistent framework to build upon for information sharing across healthcare networks. While many industry professionals agree that the standards’ benefits are well aligned with the ultimate goal of interoperability, one of the greatest challenges facing the Health Story Project is creating momentum for adoption. Currently, the group plans to get out on the speaking circuit, create educational papers and white papers around successes, and leverage the influence of its partners. Hopes for building future momentum toward adoption also depend on the project’s ability to get the standards accepted on a national level, according to Alschuler. “If they become national standards, they become part of the [incentives] offered by government,” she says. To accomplish this task, the standards will have to go before the Healthcare Information Technology Standards Panel, an item that is currently on the agenda. While the national standard framework will open new doors for the initiative, Alschuler is quick to point out that for it to work, “the industry has to embrace this from its own stake.” That’s where education comes into play. Consider a typical case in which a patient with complex health issues uses a number of providers that could include a small community hospital for diagnostics, subspecialty physician practices, and a large urban hospital system for other expertise. The inability for providers to see the full picture should be a driver in any provider’s desire to adopt these standards, asserts Alschuler, who adds that such a move would allow organizations to share data even without an EMR in place. van Terheyden agrees, adding that alongside information flow to providers, the project pushes forward the idea of personal health records (PHRs) by empowering the individual. “I believe [PHR use] is a significant aspect of our future … critical to this is the ability to feed those records in an intelligent way,” he explains. Currently, as individuals try to piece their records together from a number of sources, the task often becomes insurmountable. That’s an area where the project expects to shine. “As we move to a ‘health story concept,’ there is no reason information couldn’t be passed to me as an individual along the Web or on a CD. It allows that rich clinical content to be much more transferrable and contributes to ownership,” van Terheyden says. Proponents say it’s another example of how the project can get information where it needs to be—in the hands of providers and consumers—and not buried to such an extent that it is inaccessible.